I love surprise celebrations. Whether a school throws a party for decreasing its number of absences in a semester or a company rewards its employees for meeting a sales goal, why not recognize the moment with a little fun? Which is exactly what Arby's is doing now that they have reached the milestone of amassing two million Facebook fans! That's a whole lot of Facebook fans! Instead of just saying thanks, Arby's is celebrating by launching a new program in honor of each one of their 2,000,000 fans: the Arby’s Fan of the Week. Each week, Arby's will randomly choose a new fan to receive the coveted title of Fan of the Week and a $25 gift card to Arby's. To enter, fans simply upload a photo of themselves enjoying a meal at their local Arby's to Facebook and wait to see the new winner announced each Friday. To kick off the new initiative, Arby's has brought back a fan from their past and has crowned Donelle Norblom from Denver, CO as the first Fan of the Week. A celebrity from 1970, Donelle made headlines at age 13 as the two millionth customer at Arby's, making it appropriate that she was asked to become the historic two millionth Facebook fan for the company. Arby's even put together a cute video (available on their YouTube page) in honor of the momentous occasion, which really brought a smile to my face. I can't imagine how excited Donelle must have been at age 13 to get to be the center of all of that attention simply over wanting a roast beef sandwich! "Becoming the two millionth Arby's customer in 1970 made me really popular in school that year," said Donelle. "I'm so excited to be able to celebrate this new Facebook milestone with Arby's more than forty years later!" 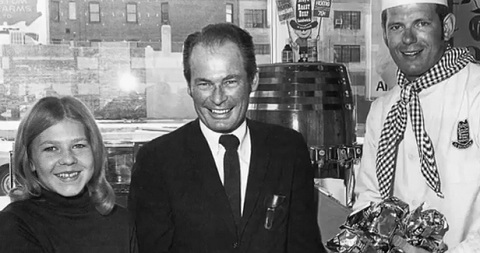 In addition to the longtime friendship between Arby's and Donelle, Arby's is also rewarding anyone that can prove that they were friends with Donelle in 1970! Friends simply upload a photo of themselves with Donelle from 1970 and they will also receive a $25 Arby's gift certificate. What are you waiting for? Following Donelle's reign as Fan of the Week it will be your chance to take over this coveted title (not to mention receiving your own $25 gift card to enjoy during your next visit to Arby's)! Head in to your local Arby's and take a photo of yourself enjoying a meal and then upload it to be entered! Three lucky people will win a $5 gift card to Arby's! A big thank you to Arby's for providing gift cards for three lucky giveaway winners. The opinions shared are my own and honest and if you really need to see more, click here to see how I roll. Arby's melt with cheddar and red ranch. My favorite is the regular roast beef sandwich. I'm a fan of the original roast beef with Arby's sauce. I always liked the "classic?" roast beef and cheese, but i recently tries an really tasty new sandwich which was wonderful! I would know it on the menu but can't think of the name now. Very good! I love the curly fries! Love the beef n cheddar! My favorite was the Super Roast Beef till they removed it from the menu. Roast Turkey Ranch & Bacon Market Fresh Sandwich is my favorite! The original roast beef sandwich with curly fries - yum! I love the Arby's Melt! My favorite is the beef and cheddar. I like their curly fries the best. I love their Roast Beef Sandwiches! And the curly fries are pretty good, too. I like the Chocolate Turnovers! The fish sandwich!! It only comes out a certain time every year but man it is the best! My favorite is their Beef n' Cheddar sandwich. Ohh...which to mention?? I love so many things on their menu. I love their Beef and Cheddar sandwiches the best, I think, but also LOVE the Jalapeno Bites! My favorite is the Beef N Cheddar! i like their beef n cheddars! Arby's med. roast beef with lettuce, tomato and mayo. 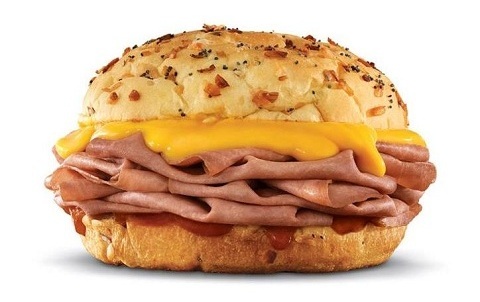 I love the plain roast beef sandwich with lots of Arbys sauce. I love their curly fries. I like the Beef and Cheddar. I love the huge blts! I like their curly fries! I love the turkey and cheddar sandwich w/ curly fries!! The beef and cheddar have always been my favorite. I usually order their Roast Beef Sandwich, curly fries, and their mocha shake. I love their classic Beef N Cheddar and their curly fries! My favorite is the Classic Roast Beef. I like their curly fries. curly fries with arby's sauce. I love the original roast beef sandwich and curly fries. I love the roast turkey and swiss with curly fries! I love their curly fries and cheese! I love the jamocha shakes. I like the Roast Beef with Cheese and their curly fries...their chocolate milkshakes are also great! I like their Mozz Sticks and Curly Fries! I love the beef n cheddar sandwich and the jalapeno poppers. Thanks so much for the fantastic giveaway! I love their jamocha milkshakes!! My favorite thing is a Beef 'n Cheddar combo meal with Curly Fries and a Jamocha Shake followed by a cherry turnover for dessert. Their cheese sticks are my favorite! Chicken Bacon Swiss with extra packets of Mayo!! The Two Sauces Combined are great! The curly fries with a cup of cheddar to dip them in. love the beef n cheddar sandwich & curly fries! Beef and cheddar with curly fries, but my favorite FORMER Arby's menu item were the jalapeño poppers and the Zante fe chicken salad. So sad they took them off of the menu. I love the Beef & Cheddar sandwich. I like the plain roast beef sandwhich! The classic roast beef with horsey sauce ! I always get the Market Fresh BLT with curly fries. I like Beef n Cheddars! I love the chicken fingers! I've always loved their Beef n Cheddar sandwiches. I like the Grand Turkey Club sandwich. I love ham and cheese. They have the best curly fries. love the beef and cheddar! I like the chicken salad sandwich with grapes and pecans. I love Arby's Super Roast Beef. I love the Beef 'n Cheddar Sandwich! Beef and cheddar all the way! 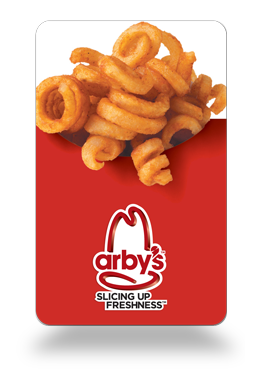 My favorite from Arby's is the Curly Fries! I have always loved their Potato Cakes. I like their SUper Roast Beef Sandwich! I almost always get the Chicken Cordon Bleu! Yum! I LOVE Arby's Curly fries and shakes!! The roast beef sandwich is the best. I love the Beef n' Cheddar! My favorite Arby item is the Super Roast Beef. I like to order this with their homestyle fries. Both of these items are no longer listed on the menu where I live (they are shown as limited availability on the Arby's Menu website) but I am still able to order them. The chicken cordon bleu sandwich. I love the Beef and Cheddar!!! Its my fave! I like market fresh ROAST TURKEY & SWISS sandwich. I love the Jamocha shake. I love the curly fries with a cup of cheddar. My favorite item is the Beef and Cheddar with several packages of arby sauce that I eat on the side. I love their Philly Ultimate Angus Beef! I love the Curly Fries. Sometimes I will order the ham & cheese junior sandwich and prior to eating the sandwich I will swish my fries in the cheese sauce that is on the sandwich. Yum! Roast Beef with Cheese and their curly fries. I love their regular roast beed sandwich, yumm! I don't remember the name of the sandwich but it has turkey & cranberries. Yummy! Beef N Cheddar is my favorite! I LOVE their roast beef...but recently have been addicted to the Turkey and Swiss Market Fresh sandwhich! The curly fries are my favorite! I'm a fan of just a regular roast beef sandwich with some Arby's sauce. Roast Beef Sandwich with Curly Fries. I also like their mozzarella sticks. Thanks. I love the regular Roast Beef sandwich.